Forest City Fashionista: Oh The Places You'll Go! And with my feet in THESE shoes, I am thinking that anything is possible. Shoes that are as awesome as these must have special powers. Adventure is calling, and the shoes say GO! Who am I to argue with shoes like these? Those are truly fabulous Seussian shoes! Wonderful! I like your action shot! Those shoes surely must have superpowers! I love the pink and red combo too. Oh ya! Those shoes are awesome! I almost got them! 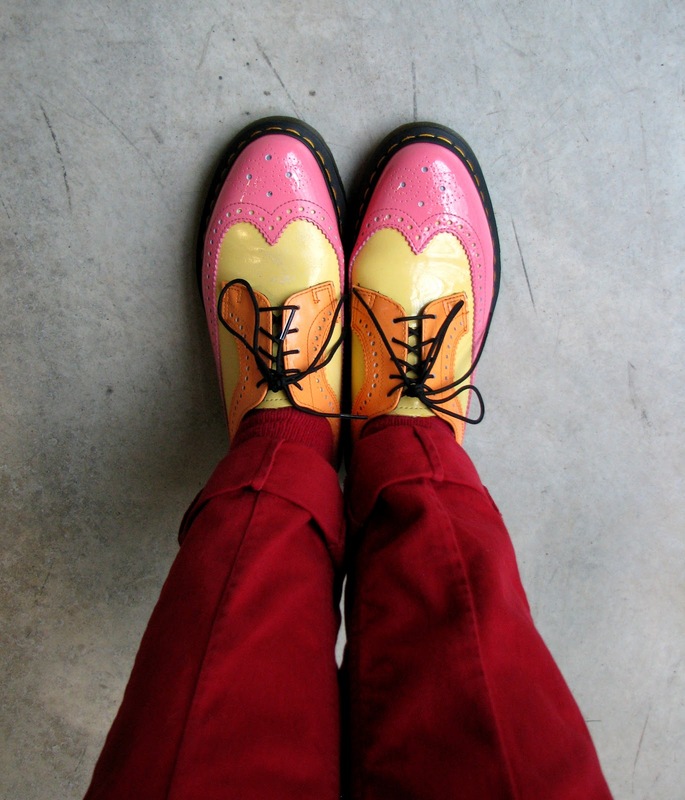 Instead i have the pink and yellow docs!i love them so and they are ultra confortable and too have a spring when i wear my Docs! LOVE this post!!!!! Full of joy!!!! Luv luv luv the Docs!! They scream spring - in all senses of the word! Well that just cheered me up, and left a good thought in my brain right before going to sleep! I'll blame it on the shoes, but also on Dr. Seuss and you, a formidable combination!!! I can't concentrate with you jumping up on the rail like that! It makes me nervous!! You look like you're about to fly right over! Oh, the shoes, the shoes! Dr. Seuss was a genius. 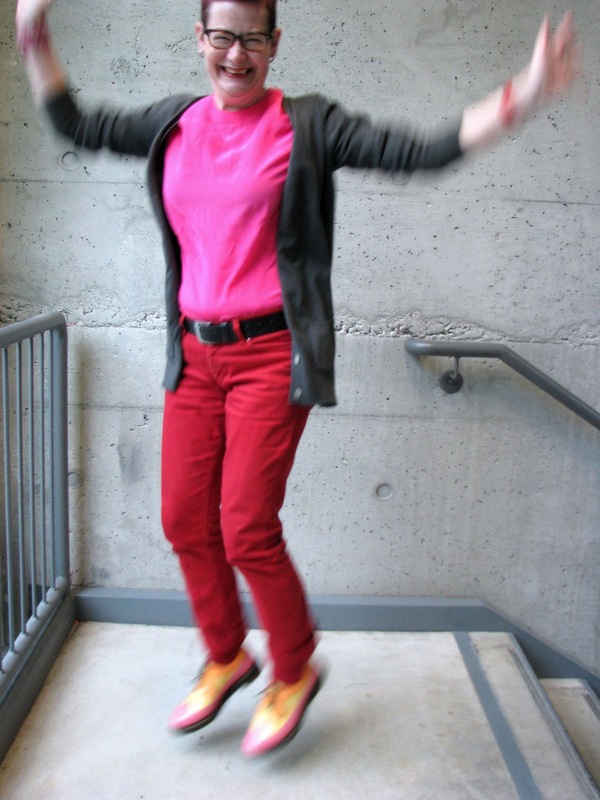 I love the neon pink and those red pants with those magic shoes. They are the perfect vehicle for a happy foot passenger. I got that book when I graduated college. One of the best. And yes every adult should read it. holy cow those shoes are crazy amazing! I love that Dr.Suess "story"! Those shoes are freaking AMAZING!! I'll bet they put a zip in your step!!! These are the most fantastic pair of wing-tips I've EVER seen. So much color and total abandon! Who wouldn't jump for joy in those shoes? best shoes ever, you must smile every time you look down. wouuauuu, these are The Shoes, they have special powers and You are my favorite Heroine fighting dreariness with your fabulous attitude!!! I always read your blog and this time I must say - who would not be happy in those shoes. I love the text. Ooooh, I can't tell you how much I love these shoes! They are fabulous, and I too would be doing a happy dance if I had them on. Awesome shoes and great colours. Those shoes would cheer anyone up on a dull day. Happy feet and I imagine they are very comfortable too! 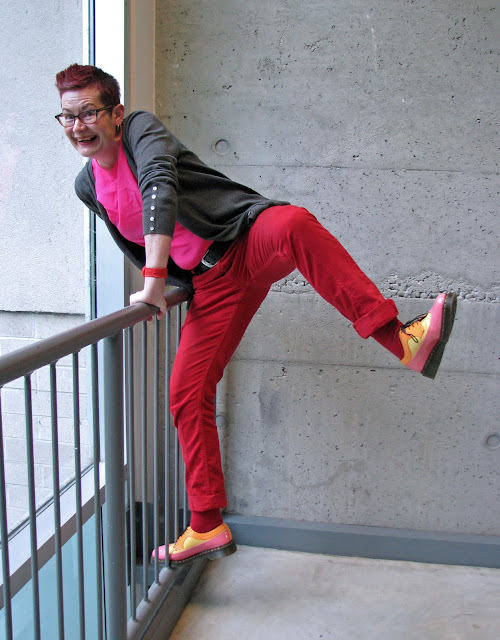 Nobody can wear those shoes like you do. Dance on, wild thing! That is my favourite ever book - 98 and three quarters percent guaranteed! But those shoes are a 100! Aren't Docs just stepping up to another level of wonderful? Love, love, love! Those shoes. That smile. Perfect Shoe Shine kicks.